What’s the secret behind a coffee company hailing from an often-wet, increasingly-cosmopolitan city in the northwest of the United States also home to Microsoft, Boeing and Frasier? What started out as a small, waterfront, independent coffee shop is now a mega-chain spanning the world. How’s that? I’d like to offer a suggestion on one of the many factor’s that may have contributed to the success of this business, and the secret is in the quote. In 2011 we live, in the West, in a media-driven, marketing-saturated, individualistic society. Yes, there are many more things that could be said about the time that we live in but one thing for sure is that we live in an era where it’s ‘all about me’. We are entertained as individuals and sold things on the basis that they will make us, as individuals, happy. Philosophers say that we live in post-modern times where the spirit of the age promotes tolerance, personal creativity and expression, with freedom to believe whatever we want to. We get to choose for ourselves and no one can take that away from us. We want things our way. We want our experiences (by which we measure our lives) to be unique and often spontaneous. And so to Starbucks. The coffee shop where we can order our coffee a hundred different ways – and ultimately have it our way. What may have started as a highly successful marketing campaign for Burger King has turned into a mantra for the modern age. But let’s look a little further. Yes, we can have our coffee however we want it – but once our preference has been made we usually go back for the same drink time and time again. What’s more, we go to the same store to get it in. Even if it’s in another city, even in another country. The coffee I had in a Starbucks in China was ordered at the same bar as the one in Chicago, as the one in London, as the one Bangkok, as the one in … the list goes on. The order process is exactly the same. The prices, remarkably the same (i.e. just a bit more than what you’d expect to pay for a coffee in that area). The coffee you get tastes pretty much the same. I sit at the same tables and browse the same merchandise (same mugs, different names on them), and enjoy it when the same free samples from the same green-apron-clad baristas come around. So why do I go back to Starbucks? It’s not simply the coffee (average to good). It’s not the prices (there’s a reason it’s known as five-bucks in the US). In a word, it’s familiar. It’s the fact that I know what I’m getting and in this age of random change, that’s comforting. And so I know that I can get work done in a Starbucks. I can chat to a friend or a read a book in a Starbucks. I know what I am getting so I can get on with what I’m doing. And by the global success of the chain I know that it’s not just me that keeps coming back. Perhaps in this age of chance and unique expression that tends towards myth over fact and tolerance over truth there’s a hunger in us for the steady, the predictable, the known, a small unchanging experience that lets me be me but on the basis of something that stays the same. Perhaps one day we’ll wise up to the idea that our personal expression must be rooted in something unchanging. That to be meaningful we must start from true meaning. That freedom only works when built upon form and that maybe our ‘post-modern’ era is just another attempt at living life that, when reflected upon, misses something at the core of who we are as humans. 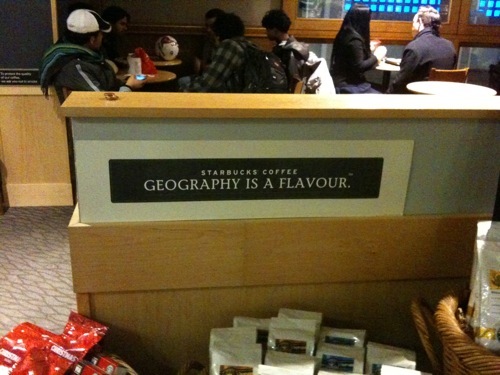 Starbucks knows it. Their savvy marketing team knows it. Will we realise it? All thoughts to ponder over a Grande, triple, two-pump, extra-hot Mocha with whip (or however you take your coffee).